Explore and draw some of London’s newest and dynamic public spaces. Starting at the RIBA in the morning, you will study a selection of the British Architectural Library’s world-class collection of photos, books and journals to learning about the history of architectural developments around King's Cross and its locality. This will provide you with context for the day to inspire your own thinking and creative drawing work. We will then take to the streets for an onsite walking and drawing tour around the King’s Cross, Granary Square and Coal Drops Yard areas. We’ll see the history and evolution of this ever-expanding development first hand and try out new drawing skills whilst on the move. Returning to the RIBA at the end, we will continue drawing and debate the effect of privately owned public spaces and what it means for the future of the city. 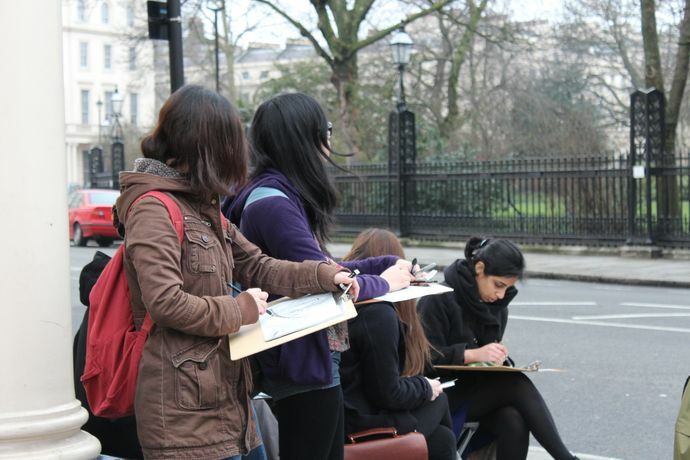 By the end of the day, you will have gained a greater knowledge of the history as well as current and future architectural developments around King's Cross and have learnt new architectural drawing skills using a variety of tools and techniques.